Over the years we’ve learned there’s always a great story behind every prize-winning ace or putt. Check out some of Hole In One International’s most unique golf winners and the prizes they have won. Congratulations to Logan Bellinger of Rehoboth, Delaware! Eighteen-year-old Bellinger was drawn via raffle to enter a putting contest during the Eastern Sussex Ducks Unlimited Dinner at Rehoboth Beach Convention Center on December 2nd. Defying all odds, Bellinger holed the 50-ft. putt with a single tap of his putter. 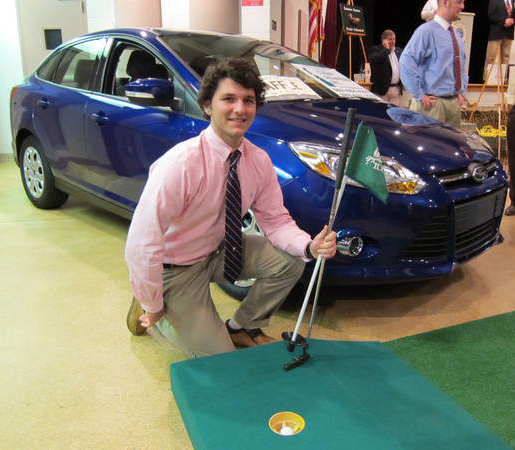 And even more exciting is the fact that his feat scored him a brand new 2012 Ford Focus SE, valued at $20,000…. courtesy of Boulevard Auto Sales and paid for Hole In One International’s sister company, Odds On Promotions! Talk about exciting! Check out the roars from the crowd for yourself below when you watch the putt in action. This amazing putting contest video contains celebratory strong language … and when you see this incredible shot, you’ll understand why! Interested in receiving a free, no-obligation quote on an indoor putting contest of your own? Feel free to give Odds On Promotions a call at 888-827-2249… or send them an email!